Every organization’s Sales is structured in a certain way. This structure needs to be represented in SAP based on pre-defined organizational elements and combine them in a pre-defined way. This method of representing all the different organizational elements of the company in a structured way is called Enterprise Structure. Organizational elements or Org Units for short are a system representation of an actual company organizational unit. For example, an org unit in real life could be a particular product division, or a Sales Office in Seattle, or a manufacturing plant in Boston or a warehouse in Alabama. The following picture shows how an enterprise structure is created in SAP. 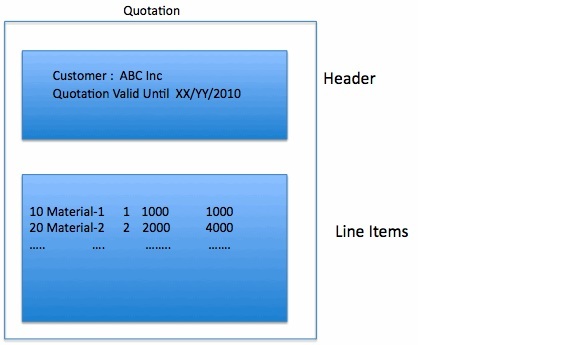 Sales-to-Sales Document Flow: For example you can create a Sales Order from a Contract or a Quotation. 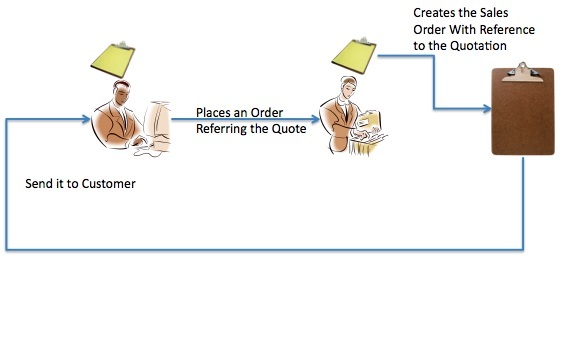 Sales-to-Delivery Document Flow: For example you can create a standard or a rush delivery from an order. Similarly you can create a consignment delivery from a consignment. 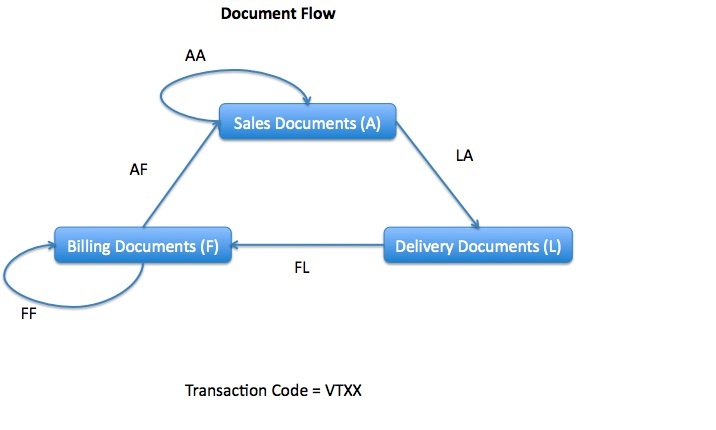 Delivery-to-Billing Document Flow: A standard invoice is created with reference to a delivery. Billing-to-Billing Document Flow: Invoice cancellations are typically done with respect to the original invoice. Billing-to-Sales Document Flow: In case of debit memo requests or credit memo requests, the original invoice is used as a reference document. SD is organized according to sales organization, distribution channel and division. A combination of these three organizational units forms the sales area. The following graphic displays these organizational elements. In sales organization 1000, sales and distribution transactions can be carried out through all distribution channels and for all divisions. In sales organization 2000, products of both division 01 and division 02 are only sold through distribution channel 10. The organization in Sales is represented by the elements sales office, sales group and salespersons. 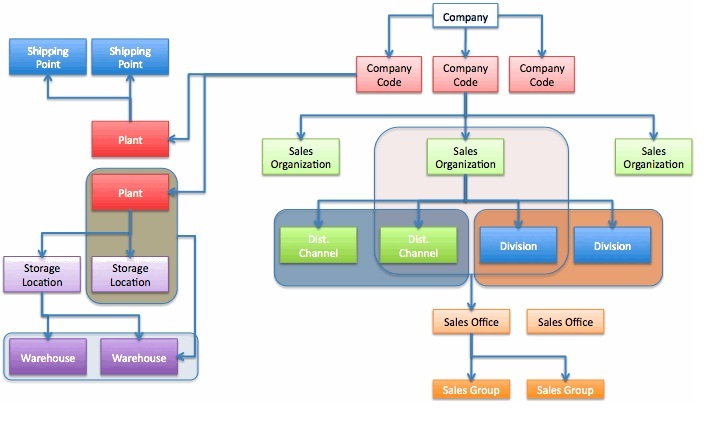 The following figure displays a sample organization in business development and sales. The staff of a sales office may be subdivided into sales groups. For example, sales groups can be defined for individual divisions. You can maintain personnel master records for sales representatives in your company. In the personnel master record, you assign the salesperson to the sales office and the sales group. You can also enter the system user name of the sales person. This allows mails to be sent to the salesperson (define the partner function for sales personnel in the sales document). Independent organizational entities, such as shipping points, are responsible for scheduling and processing deliveries to customers, as well as replenishment deliveries to your own warehouses. Shipping points can be subdivided into loading points. For example, ramp 1, ramp 2 and ramp 3 belong to the shipping point Forwarding depot. The following figure displays a possible organization in shipping. The transportation planning point is an organizational unit in Logistics, responsible for planning and processing transportation activities. It organizes the responsibilities in a company, e.g. according to shipment type, mode of transport or regional departments. The shipping point is assigned to a plant. Loading points are assigned to shipping points. The plants allowed for sales are determined for each sales organization according to the distribution channel, so that a sales organization can sell goods from several plants. A plant can be assigned to different sales organizations. All of these sales organizations can sell from that plant. You can differentiate further between the plants belonging to a sales organization from the sales view using the distribution channel. For certain plants within a sales organization, the distribution channel "sales from plant" is allowed, but not for others. The following figure shows an assignment of sales organizations and plants. A company deals with different natural and legal persons during business transactions: A customer orders goods from your company. A forwarding agent might deliver goods to the customer. An employee within the company processes the business transactions. All roles a natural or legal person can assume are represented by business partners in the SAP R/3 System. A company has contact with its business partners, who are customers and vendors. Data on each of these and on the company's personnel is stored in a separate master record. The term "customer" is used to define all customers to whom the company has contact. The term "vendor" is used to define all business partners who carry out a delivery or a service for the company. A business partner can be a customer and a vendor at the same time if, for example, your customer also supplies goods to you. In this case, both a customer master record and a vendor master record must be created for the business partner. You can create a link between the master records by entering the vendor number in the customer master record and the customer number in the vendor master record. Data on business partners who are vendors, for example, forwarding agents, is managed in the vendor master record. If a vendor is also a customer, a link can be created. Data on employees of your own company, for example, sales personnel or clerical staff, is managed in the personnel master record. Data on each employee can be managed by his or her personnel number. Only the personnel department of your company is authorized to create a personnel master record, using Human Resources (HR). The personnel department of your company manages the personnel numbers of the employees. If HR is not used in your company, you can create a personnel master record yourself for employees in sales and distribution. You enter data on business partners with whom your company has a business relationship in master records. Master records contain all data necessary for processing business transactions. This is known as master data. If you enter all master data, you spend less time processing business transactions because the system proposes the master data in these transactions. Financial Accounting and Logistics use master data. General data and data relevant to both departments is stored in shared master records to avoid duplication. You can create and change master records using groups of data that differ in the level of detail. Use partner functions to define the rights and responsibilities of each business partner in a business transaction. You assign partner functions when you create a master record for a business partner. You can use this partner function, for example, to assign a buyer within your company to a vendor. A consumer is a natural, private business partner with whom you have a relationship involving the transfer of goods and services. You create customer master records for business partners who are consumers. Products and services are combined in the SAP R/3 System under the term material. All information necessary for the management of a material and its stocks, as well as its use, is maintained in the so-called material master record. This includes, for example, data on purchasing, on sales and on storage. Different company areas and SAP modules access the material master records, which therefore must meet a wide variety of requirements. During sales processing, the system repeatedly accesses the material master records. It is one of the basic sources of data for sales processing. The material master record is accessed, for example, in the inquiry, in the quotation and in the sales order. Data in the material master record is also of great importance for shipping and billing. However, the data required for shipping, for example, is not the same as that required for sales or billing. 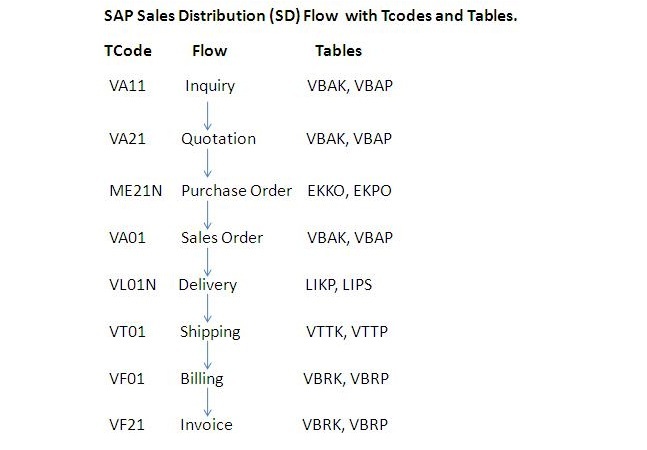 Material types in the SAP standard version are, for example, raw materials, trading goods, semi-finished products, finished products, or services. 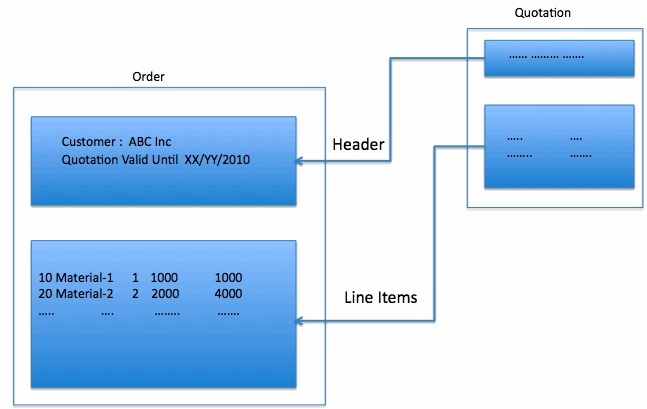 The material type represents certain features of materials in the system, and has important control functions: the material type is used, among other things, to group field selection functions for a material, or to define the screen sequence, the type of number assignment and number ranges during material master record maintenance. Depending on the material type, company areas maintain different data screens. This screen selection applying specifically to an application is called a "view". Trading goods are movable goods intended for commercial exchange. Examples of trading goods are market goods, consumption goods and durable goods. Trading goods are always bought and re-sold by your company. The material master record for trading goods therefore always contains purchasing data and sales data. Trading goods are managed in the SAP R/3 System using the key HAWA. Services are represented and managed in the SAP System as materials. Services are immaterial goods that differ from other goods, particularly in that their production and consumption coincide. Services are generally regarded as non-transportable and non-stockable. Typical services are commercial services, transport services, bank and insurance services, goods from cultural organizations and the mass media, as well as services provided by the public security forces or the education and health sectors. Since services cannot be stored, a material master record of this material type does not contain inventory data or inventory management data. No fields for gross weight, net weight or unit of weight are included in the basic data for a service, as are for other material types. Services are managed in the SAP R/3 System with the key DIEN. This material type includes all materials needed for packaging. For example, boxes or crates. Packaging materials are managed in the SAP R/3 System with the key VERP. Materials which cannot be assigned to any of the standard material types, can be maintained, as "Other material". Thus, besides standard material types (trading goods, finished products, services etc.) you can also create additional material types. When creating such a material, note that a material type must be entered on the first data screen. For standard material types, this entry is not necessary because the material type is selected in the menu. The order of priority is as in the list above. If, for example, one of your customers uses a number for a material, which differs from the number your company uses to identify it, you can store the material number used by the customer in the customer material information record.